I'm very pleased to have appeared on the prestigious Lawyer 2 Lawyer podcast on the Legal Talk Network with host Robert Ambrogi. Show Description: From music to film to theatre, celebrities can be a challenge in an entertainment law practice. Attorney and co-host Bob Ambrogi welcomes Gordon Firemark, an entertainment and new media lawyer in Los Angeles, to take a look at entertainment litigation and working with a celebrity. Bob & Gordon look at the various legal cases in Hollywood and chat about Gordon’s new e-book, The Podcast, Blog & New Media Producer’s Legal Survival Guide. I'm very pleased to have been invited to appear on the prestigious Lawyer 2 Lawyer podcast on the Legal Talk Network with host Robert Ambrogi. The episode, to be recoded on October 28th, will focus on entertainment law, particularly some of the challenges in representing celebrity clients. I'm honored and excited to be joining Bob for the show. The show will be available via iTunes, and I'll also be posting a link and player. 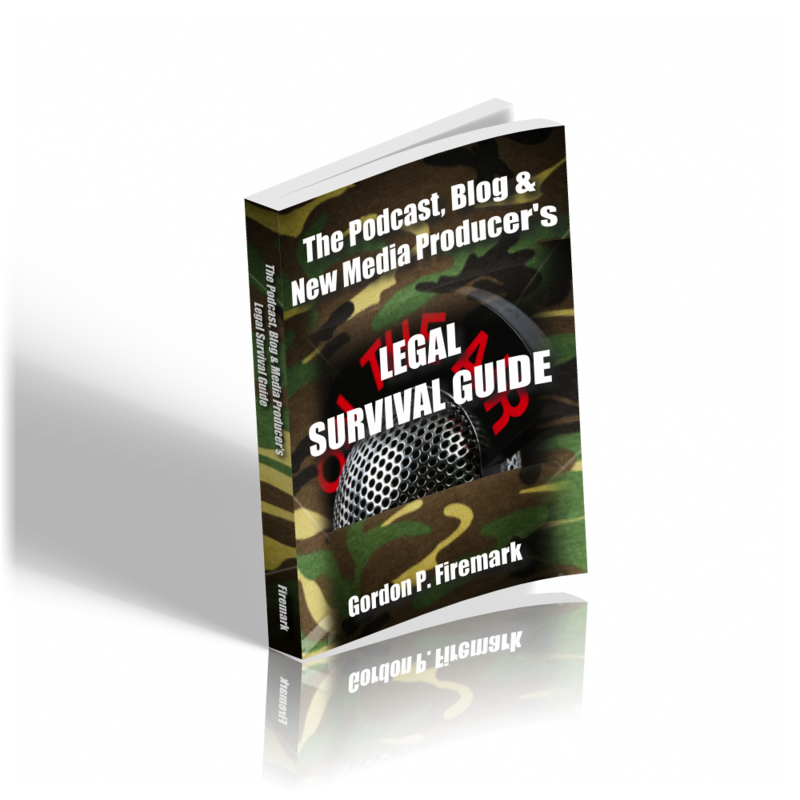 My ebook, The Podcast, Blog & New Media Producer's Legal Survival Guide is now available for sale. The Guide is the first comprehensive ebook that gives a clear, concise and layman friendly explanation of the legal principles, issues and claims that can arise for producers of internet-based media. Written by veteran entertainment and media lawyer, Gordon Firemark, this guide is designed to help those who write blogs, host & produce podcasts, or distribute video or other media via the Internet avoid the most common mistakes that lead to threats, recriminations and lawsuits. Also included are several free bonus reports, sample letters and checklists! Forewarned is forearmed. The information in The Podcast, Blog & New Media Producers’ Legal Survival Guide can save you tens- or hundreds- of thousands of dollars in legal fees, months or even years of litigation, and countless sleepless nights. Don’t Wait! GET this e-book right now, and Learn what you need to know to stay out of legal trouble with your podcast, blog or new media content. Asked & Answered: Legendary characters – public domain or protected? Coming Soon: My Podcast Law and Theatre Law (e)Books!